October 2017: The Top-of-the-Lake Pure Michigan Byway has been dedicated. 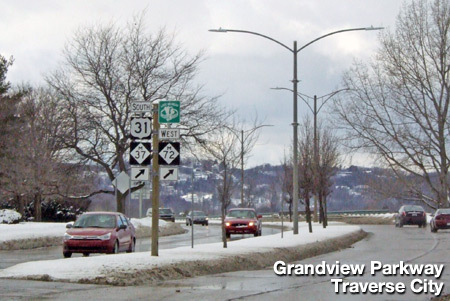 August 2017: A spate of jurisidictional transfers in Grand Rapids affects several routes. January 2017: An entirely overhauled and expanded I-96 route listing—with more than 180% more information in the listing than before! July 2016: The West Michigan Pike Historic Byway debuts. Check out the What's New? page for a complete listing of every website update! Welcome to the Michigan Highways website, dedicated to the past, present and future of the Michigan State Trunkline Highway system as well as other highways and routes throughout the Great Lakes State. 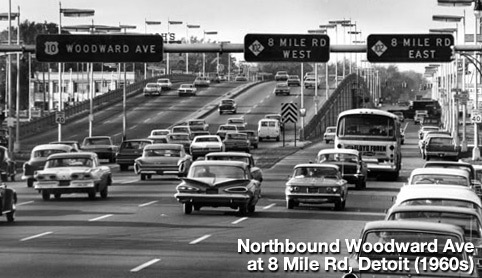 This website is intended to be a clearinghouse of information on Michigan's highways, from easily-recognized facts to the little-known trivia. It is also meant to change as the state trunkline system changes. A major part of this website are the Highway Listings which contain information on every state trunkline highway in Michigan, as well as other non-state-maintained routes. The timeframe covered by this site is generally from 1913—the year the first trunklines were designated—to present, although the history of roads in Michigan back to the time prior to European settlement is included. The navigation tools provided, including the menus across the top of each page, should help you navigate through the website. More content and new information is always in the planning. Please check back regularly to see what has been added! Be sure to check out any of the informative articles in the In Depth: News & Articles section by accessing the menu at the top of the page. Only a sampling of the available articles are listed on the main navigation menu—select All In Depth Articles to see a complete listing.